July 2011. Brotherhood of The Wind/ Motorcycle Road Culture in America. New Mexico. Choppers. Hogs. Bobbers. Basket Cases. Crotch Rockets. Stallions and Steel horses. The nicknames for motorcycles are many, and they suggest the connection that a rider has to his bike. When the driving requirement involves straddling your vehicle and using your whole body to direct it, intimacy is the only possible result. 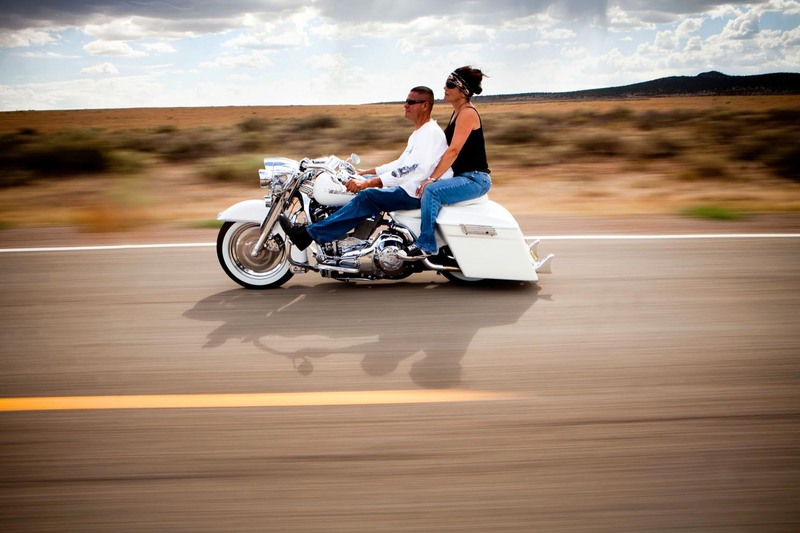 Here, Jose and Karen Valdez, on a customized white 2006 Harley Road King. "I cleaned the bike with elbow greese that morning. It's a special bike, not as comfortable as others but much classier", said Joe. The couple rode with a group of friends and collegues from Espaniola Valley on Route 64, New Mexico, while on a 'Poker Run', a scholarship benefit ride for the local school. Piotr Redlinski for The New York Times.